The Southwest is the hottest and driest region in the U.S., where the availability of water has defined its landscapes, history of human settlement, and modern economy. Climate changes pose challenges for an already parched region that is expected to get hotter and, in its southern half, significantly drier. 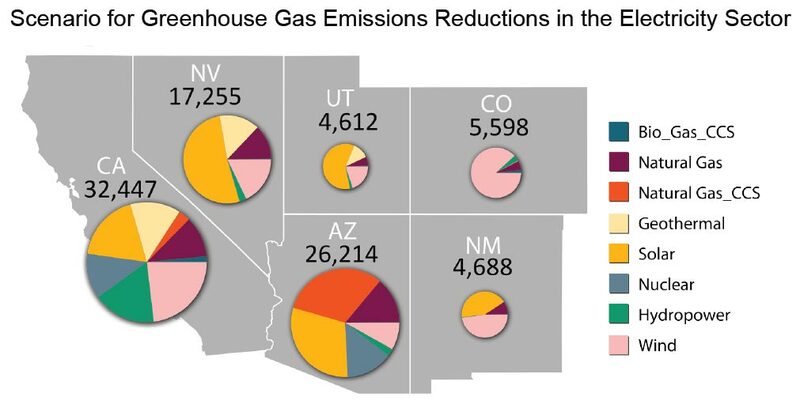 Heat, drought, and competition for water supplies will increase in the Southwest with continued climate change. Increased heat and changes to rain and snowpack will send ripple effects throughout the region, affecting 56 million people – a population expected to increase to 94 million by 20502 – and its critical agriculture sector. 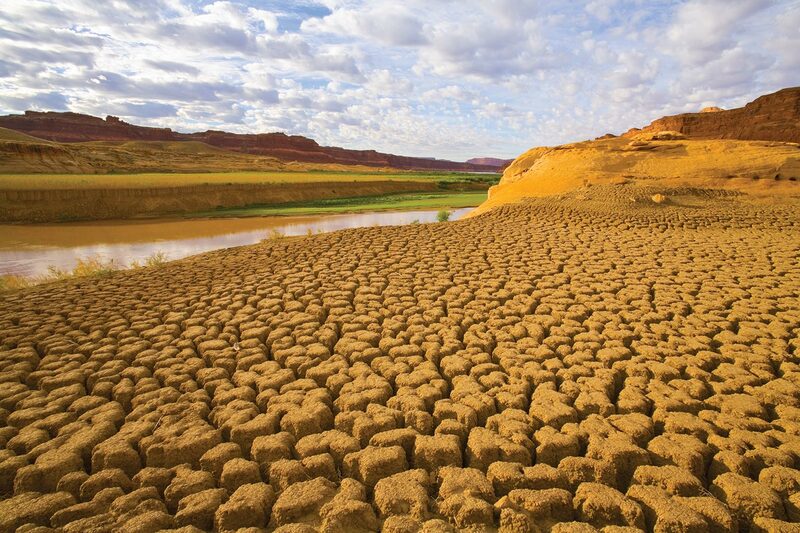 Severe and sustained drought will stress water sources, already over-utilized in many areas, forcing increasing competition among farmers, energy producers, urban dwellers, and ecosystems for the region’s most precious resource. The region’s populous coastal cities face rising sea levels, extreme high tides, and storm surges, which pose particular risks to highways, bridges, power plants, and sewage treatment plants. Climate-related challenges also increase risks to critical port cities, which handle half of the nation’s incoming shipping containers. The region’s rich diversity of plant and animal species will be increasingly stressed. Widespread tree death and fires, which already have caused billions of dollars in economic losses, are projected to increase. Tourism and recreation also face climate change challenges, including reduced streamflow and a shorter snow season, influencing everything from the ski industry to lake and river recreation. 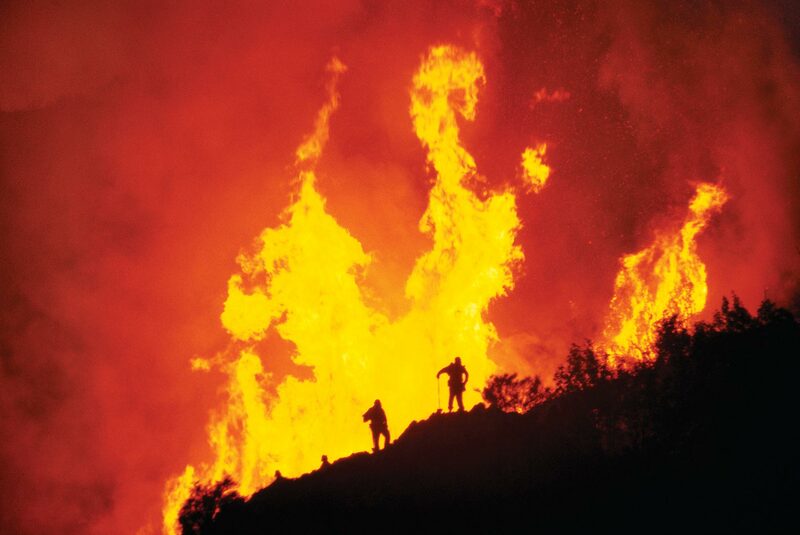 Climate change contributes to increasing fires. Once temperatures increase beyond optimum growing thresholds, further increases, like those projected beyond 2050, can cause large decreases in crop yields and hurt the region’s agricultural economy. 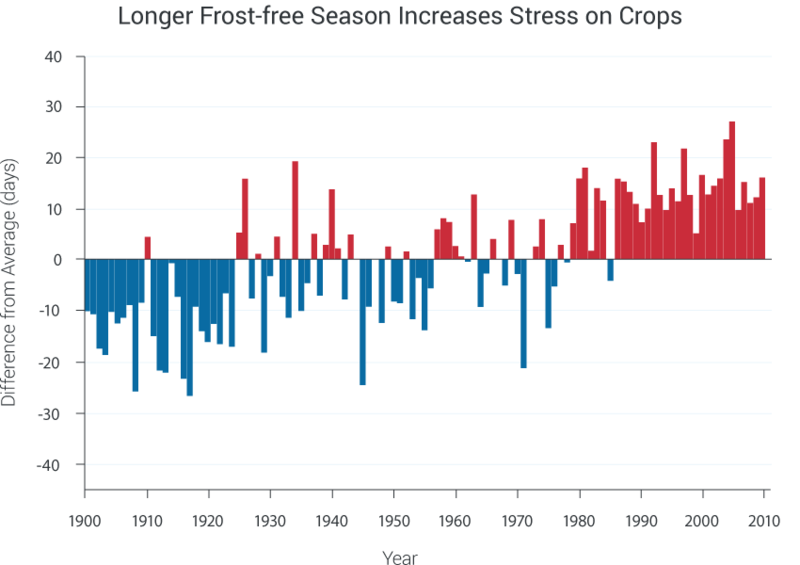 Graph shows significant increases in the number of consecutive frost-free days per year in the past three decades compared to the 1901-2010 average. This leads to further heat stress on plants and increased water demands for crops. Warmer winters can also lead to early bud burst or bloom of some perennial plants, resulting in frost damage when cold conditions occur in late spring. Higher winter temperatures also allow some agricultural pests to persist year-round, and may allow new pests and diseases to become established.1 (Figure source: Hoerling et al. 20132). Climate change is exacerbating the major factors that lead to wildfire: heat, drought, and dead trees.12,13,14,15 Between 1970 and 2003, warmer and drier conditions increased burned area in western U.S. mid-elevation conifer forests by 650%.16 Climate outweighed other factors in determining burned area in the western U.S. from 1916 to 2003.17 Winter warming due to climate change has exacerbated bark beetle outbreaks by allowing more beetles, which normally die in cold weather, to survive and reproduce.18 More wildfire is projected as climate change continues,15,19,20,21,22 including a doubling of burned area in the southern Rockies,21 and up to 74% more fires in California.22 For more on fire in the Southwest see pages 53-54.